Thanks for signing up for ‘Mastering the Art of Cooking on a Budget’ at the Stonesoup Virtual Cookery School! Remember you have LIFETIME access to this material so feel free to go at your own pace. And revisit the material whenever you like. § an insiders guide to use by dates – when should you throw food out? Please feel free to ask away in the comments section on each page! Happy to answer any questions you may have. Even if not related to cooking on a budget. ps. Like to win a FREE copy of one of my print books? All you need to do is leave a comment anywhere on this website. I read all the comments and every week give away a copy of your choice of my print book ‘5-Ingredients 10-Minutes’ or one of my ebooks. Each weekly winner is notified by email. back to: The SVCS Content Overview Page. note: Sorry, if you’ve only signed up for the Budget class, you won’t be able to access this page. I bought your course a long time ago, but I never had the chance to watch it until now (I’m a lazy guy!). I cannot access the first two blocks of lessons since the platforms tells me I need to be a member to watch them… Is there any way to solve this? Thank you for offering this course on a sliding scale. Times are lean right now and it’s great to know I don’t have to resort to processed foods. I look forward to the course! Thank you so much for creating “Mastering the Art of Cooking on a Budget” and offering it at a “pay what you can afford” price. I am a student/starving artist and I would not have been able to afford this course at its full value. I discovered your blog while researching “how to eat healthily on a budget (or $5 per day)”. After living on various incarnations of Ramen for about 2 years, I really wanted to make a healthy change, but I had the common misconception that eating healthily was for people who don’t live pay check to pay check and actually possess cooking skills. I find your recipes very accessible for someone with non-existent cooking skills and I greatly appreciate your keeping things simple yet healthy. I am have already learned so much and I have enjoyed many of the tasty recipes in this cookbook. Looking forward to taking all the classes. 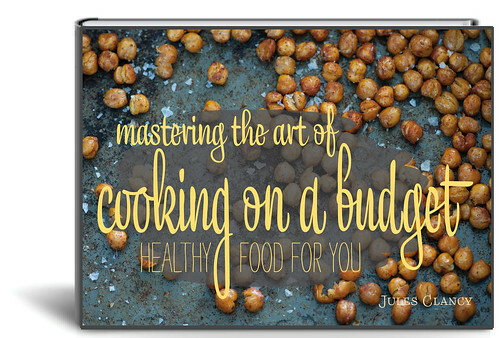 I love your enthusiasm and you are such an inspiration for fresh and healthy budget cooking. Just signed up. Want to make the best of it. I’m a very busy working mom of two…three, adding hubby. Anything you offer that is quick, healthy, vegetarian and delicious…bring it ON! So excited about this. It’s been about a year that we’ve cut out processed foods and faux foods and chemical additives. We feel so much better! But our food budget went UP instead of down, even when our youngest went off to college! Sometimes think “We just can’t afford to do this.” This class is raising my hopes again. Thank you! That’s great that you’ve already been making changes to your cooking Kristi! Sounds like this class is just what you need! I am so happy to finally be able to take one of your classes. Thank you for your generosity! I’ve been following your blog and youtube videos for over a year and have loved every bit of it. Again, Thank you! Thanks for joining us Emily! I finally bought the class after it languished for months and months in my bookmarks folder. Thank you so much for offering it on a sliding scale! My husband and I are both about to be in grad school, so we’re scrimping and saving and every penny counts. I just wanted to say thanks for offering this class. Thus far I have made the lentils, the green split peas, the green is good salad, the cheat’s hollondaise, carmelized onions, and the burger and pea mash with carmelized onions. They have all been delicious and healthy and simple. The best part is, and somewhat unexpected, is that my kids have loved everything. They are pretty adventurous and healthy eaters, but I didn’t know if these recipes would appeal to them. To my surprise and delight, they have. My 11 year-old son who has never been much of a meat eater said, “Vegetarians are so lucky. They get to eat like this all the time.” I’m looking forward to trying more of the recipes. They are available but I made a mistake in the ‘settings’. I’ve gone through and fixed it up so you should be able to access everything. Thanks for picking this one up! Hey Jules! Are the seasoning classes not available yet? All the other links worked for me but the top 5 links under Class Lessons direct me to a page stating I have to be a Premium member to access. Thanks. As a single male I need this. I can cook, but I need organisation and fresh ideas. Yay! So excited for this. I really love what you’re doing with food. You are an inspiration!